There are common elements of military service reaching back from Iraq and Afghanistan to the Second World War and beyond. In Homer’s Odyssey, Odysseus returns home from the Trojan War to find his wife no longer recognizes him. How true this is in our era of repeated deployments to remote lands, returning home unrecognized and unrecognizable. It is less challenging than one might imagine to bring together different generations of military veterans for a literary discussion. Many veterans read vast quantities of books while deployed, from their preferred reading to pulp paperbacks, romance novels, classics or just anything available. Talking Service builds on the relationship between veterans and the printed word, between deployment, literature, shared experience and coming home. It is important to note this relationship between servicemen and books is nothing new. The Armed Service Editions of classic novels exposed millions of service men and women to the classics during The Second World War. Talking Service describes itself as “a reading and discussion group for veterans”, however it has the potential to be a great deal more. Through a guided discussion of essays Talking Service encourages vets to reflect on life in combat, the transition home, and the years spent after the war searching for peace and solace. There are many veteran groups centered around fraternity, fitness, volunteerism and less sober endeavors, however it is possible to build community around Hemingway, Caputo, and The Odyssey. There is a great deal to be found among the pages of an anthology such as Standing Down: From Warrior to Civilian. In fact, building community is what veterans do best. As anyone who has been in the military, myself included, knows, a primary skill learned while in service is how to acclimate to new groups and experiences, how to make friends and work things out. This can be done as easily around great books as through a 5K run, or a fish fry. 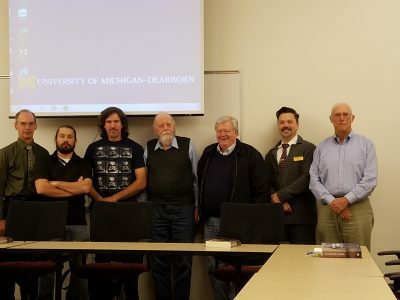 To this end The Michigan Humanities invited the University of Michigan-Dearborn to host Talking Service with the expectation we would invite our active, engaged group of student veterans, but student veterans were only part of our objective. At UM-Dearborn have a tradition of inviting veterans from the surrounding community, members of the Region 10 Veteran Community Action Team (overseeing veteran services in Wayne, Oakland, and Macomb Counties), the Dearborn Allied War Veteran Council, veteran spouses, and participants of the 17th District Veteran Court in Redford. As a result our veteran events tend to have more of an ad hoc feel, with vets of all eras, backgrounds, and experiences. Leading our discussion was Benjamin Busch, an Iraq War Veteran and author who directed our conversation of literature, war, and coming home through 3 different sessions over as many months. In addition to Ben we had 3 World War II Marines in attendance and veterans from nearly every era going back to 1940. Although the particulars of our Wars, conflicts, and service during peaceful eras were starkly different (jungles instead of deserts, conventional warfare in contrast with insurgent war, popular conflicts versus those which divided the country), there were elements of the military experience which are consistent in any time or place. In particular the endurance of hardship, nonsensical military policy, ubiquitous jargon and more have been part of the American military experience for generations. A few of the participants in the program pose for a photograph. Talking Service is an effort to enliven an understanding of shared experience through interaction with the humanities. Prior to the Talking Service sessions one Iraq War veteran wrote he was interested in Talking Service “to learn from those who’ve deployed and make myself available should anyone need assistance.” By the end of the sessions that same vet said he would recommend the program because “Vets need to come together and help each other. You are part of a family that can never be taken away.” Ultimately, that may be all we can ask of the arts, to foster a shared understanding and bring us together in a way which is substantial and permanent.